Not only are Liberals using tax dollars for partisan purposes, the ads make statements that are demonstrably false, such as the claim that BC leads in job creation. But, false claims are not new; they are a standard part of the BC Liberal style. When HST was announced they said it would be revenue neutral, result in lower consumer prices and create 113,000 jobs. In fiscal 2010, the last full year under the old system, PST raised $4.7 billion. The following year, with only nine months of HST, the combined sales taxes raised $5.5 billion. That suggests almost $100 million a month extra came in under HST. Given the staff and information resources within the Ministry of Finance, you can be sure that extra money was no surprise. Truth had been too inconvenient to be told. Misinformation abounded in the government’s effort to sell the new tax. The BC Chamber of Commerce interpreted the government initiated Mintz report to say there would be “A lower tax burden for consumers” through HST. It didn’t bother to explain how both consumers and businesses would both save while government raised hundreds of millions extra each year. Again, truth had been inconvenient. It seems clear from the finance ministry’s numbers that Liberals do not intend to reinstate PST as it was. To reinstate is to restore something to its former state. If that were planned, the expected sales tax income would be about $800 million lower than projected for the fiscal year 2013-14. People in business tell me they are expecting continuation of most exemptions enjoyed under HST. These things mean that consumers will not see a reinstated PST, they’ll see a new “improved” PST that applies as widely as HST does now. Perhaps again, truth is inconvenient. A question was posed in comments about repaying the federal government’s $1.6 billion transition grant. 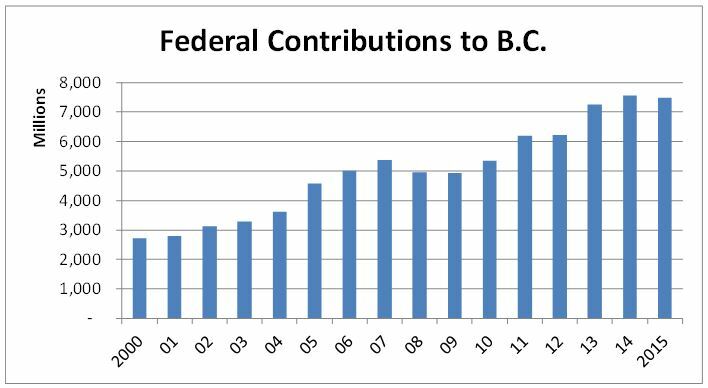 Rather than trying to determine if we did or will send that money to the feds, let’s look at the history of federal contributions to the BC budget and the estimates for the next three years. It could be that the two senior levels of government played with the numbers to use the $1.6 billion transition payment as a way to influence the outcome of the HST referendum. The last two fiscal years, and projections for the next three, show that government to government transfers are substantially above the pre-HST levels. Again, what they say and what we see reading the financial statements are not the same thing. We knew Campbell and Harper's HST, was a lying scam right from day one. Caught in a lie. The BC Liberals had to admit, the HST scam was plotted before the BC election. The HST radar papers went to Harper, faster than the speed of light. The HST is no better than, Grand Larceny. We knew for a fact? 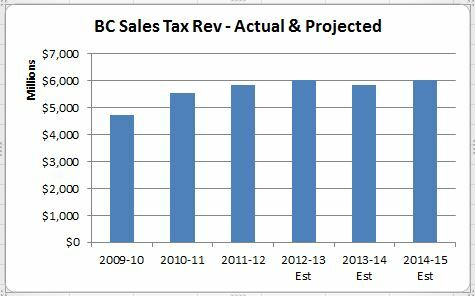 No money would “trickle” down from BC businesses HST, so called savings. They in fact, jacked up their prices even higher. One wealthy BC business owner said. He pays less tax than his secretary does. That's their boast of their trickle down? Big businesses were permitted to thieve, even more. The BC Liberals did threaten us, they could make make the PST, even worse than the HST. I believe, Kevin Falcon made that threat. The people of BC know, exactly what the Campbell/Clark BC Liberals are. However, that is not printable. I'd love to know exactly what happened with the $1.6 billion incentive we got from the Feds to switch to the HST. I know we were supposed to repay it…but I'd like to know if we somehow managed to negotiate some pro-rating (doubtful) and the terms and timing of repayment. I doubt this opaque government will answer those questions in an honest manner. Which is why we need to fire the Fiberals in 2013! As far as I recall, there was no reduction in the amount we had to pay back. So: we paid back the $1.6 billion — and they got to keep the extra GST we collected on items that weren't GST'd before. The Feds also got the benefit of banking our PST before sending it back to us, as far as I understand. What I'd like to see is border agents actually pulling cars over and collecting taxes off of them. It's one thing to go stateside for better prices, better selection — and/or just a change of scenery. It's another thing to NOT have to pay the taxes that are legitimately due, especially for day-trippers. Over the past 4-5 years, my wife and I have made 3 or 4 daytrips per year to Washington State. Typically, we'll each buy around $200 in goods… and we are ready to pay the Canadian taxes that are due. Until last week, we have been waved through with a “have a good day.” In talking to friends and relatives, it's even possible for two people to get through with $1000 in goods on a daytrip. I'm not sure if our number finally came up, or if head office has tightened the screws — but we finally paid about $48.00 in taxes on our purchases last week. Tax is even charged on the Washington State taxes, BTW! 'Anybody else noticing tighter border agents lately? With the thousands of daytrippers crossing Lower Mainland borders each day, it's got to be tens or maybe hundreds of thousands of tax dollars that are being lost each day — if the border agents aren't enforcing the rules. And these folks with jerry cans of gas in their trunks are not only inviting disaster, they are avoiding transit and road taxes. That should be calculated into the border charges too. Yes… and that might keep more people spending their money in BC, where it will be charged appropriate taxes. I'm not saying “close the borders” but I am saying “enforce the rules and if that inconveniences people, so be it.” Crossing an international border should not be as simple as crossing from Surrey into Coquitlam. “Altering exemptions now will be ignoring the referendum results and raise the anger of already overtaxed BC residents,” wrote Jordan Bateman a couple of months ago in article headed “Sneaky Libs want to expand taxation with PST”. As the article states, people were promised things would go back to the same old PST. Re snack foods: “Denmark tried a food tax but killed it after one year, noting it increased prices and administration costs (duh!) and put Danish jobs at risk. Many Danes were crossing the border into Germany to avoid the tax altogether”, his article concludes. So, not trusting the Liberals, on October 19th at 10:25 a.m. I phoned the Revenue Division of MoF, PST Outreach Project and asked them point blank if ALL PREVIOUSLY EXEMPT ITEMS WOULD AGAIN BE EXEMPT. The reply: “All previously exempt items, i.e. greens fees, restaurant meals, can of pop, will again be exempt”. But I forgot to ask his name. As though that would make a difference! A point I've made over and over again on Northern Insight is that the Liberal Government believes they have no obligation to be truthful when speaking to the public. Everything is spin. The aim of this article is to demonstrate that their numbers prove they have no intention of reinstating sales tax to the way it was pre-HST. If they did, the projected revenues would be much lower. When they created the enabling legislation, they provided for “rule by regulation.” The government can make vast changes to the way tax is applied simply by passing an order-in-council, without involvement of the Legislature. An alternative might be for distributors to price products fairly in Canada. Today I priced ventilation fans offered by a major brand. I can buy in in the USA for 45% of the price asked for here. I bought a name brand garbage disposal unit from USA for a little over $100. The same unit was well over $400 at a local appliance store. Canadian retailers are lobbying the federal government to crack down on cross-border shopping and that has been somewhat successful. They'd rather influence a few politicians than compete on price. Do you think the Libs are stupid enough to not bring back the PST in its original form so close to the election……never mind they are. Unless there's something about the election date we haven't been told. I'm with you for finding the bargains by going stateside (or elsewhere), Norm — but I expect to be dinged for the taxes when it comes across the border. My first digital camera in 2002 was $420 or so on eBay from California. Brand new. I checked with Leo's on Granville and they said they could order it in for me… at $2100. Its called fraud…and yes, it is a criminal offence! The 1% incomes increased 36%…tax them, the rest of us are “tapped out”. Norm, I noticed you didn't mention that they have also reduced the personal exemption credit for the tax year 2013. So that amounts to a double hit on our wallets. Add up the numbers. The 1.6 plus the extra 800 million collected in the first year of HST. The total of those numbers is the total obligation we had following the Olympics which was 2.3 billion. Not much of a mystery with the BC Liberals. I didn't hear about that, Anon. I misspoke above: Apparently HST did NOT add GST to any items that were untaxed previous to HST. There's a comprehensive PDF at http://www.hstinbc.ca/media/GST_PST_HST_List_v04.pdf . Wow! When you go down that list, that was quite a tax grab for the province. No wonder they had so much trouble undoing it — after having NO trouble starting it. Can anyone refresh my memory: other than getting ALL of the HST, then sending our share back to us… what did Ottawa get out of it? That $2 B went substantially to profits, resulting in higher corporate income tax payments, which go largely to the federal government. The feds, because they gain by HST, paid over a little of the extra to the province. It is also why most people think they should have pro-rated the $1.6 transition payment since the federals gained for 3 years. However, I don't think we're getting the truth on this and the chart of federal transfers supports that supposition. You can read about it at http://www.briankieran.com dated Dec. 4,2012. It has been confirmed by Canada Revenue Agency in their document “Payroll Deductions Formulas for Computer Programs”.